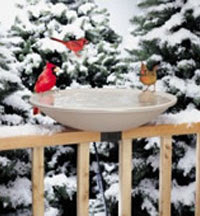 Water in Winter is For The Birds! Teacher Naturalist at Lincoln's Pioneers Park Nature Center, Publicity Chair for Bluebirds Across Nebraska, Chair Nebraska Birding Trails, Recipient of the Howard Weigers & Journal Star Conservation Award, 2006. Recipient of the Edna Shield's "Sharing Nature With Children" award.